Hackintoshes are often stereotyped as big, lumbering workstations with full-size ATX boards and 40-pound computer cases. In reality, there are quite a few Hackintosh builds based around mini-ITX motherboards, which are smaller alternatives to more standard micro-ATX and ATX motherboards. Though we might never be able assemble a computer as small as Apple's super-tiny Mac Mini, it's still easy to assemble a respectably size-conscious Hackintosh for your personal use. 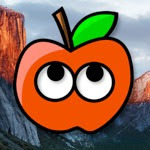 So in the interest of saving you time, I've put together a list of Hackintosh-friendly mini-ITX motherboards, all of which can run OS X Mountain Lion with Unibeast. Of course, a motherboard is only one of the many parts of a computer. You'll have to build the rest of it yourself. If you've never built a computer before, it's really quite easy-- you can learn how to do it in two or three hours by reading Lifehacker's very helpful computer-building guide. LATEST UPDATE (October 19, 2012): Added GA-H77N-WIFI and GA-Z77N-WIFI to list. 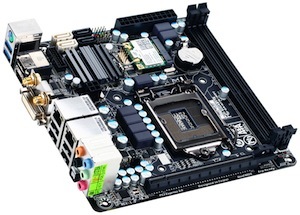 What you get: The GA-H77N-WIFI was one of the first mini-ITX motherboards that Gigabyte released for Intel's new 3rd-generation "Ivy Bridge" processors. Ivy Bridge processors are the ones with a model number that starts with a "3", such as the i5-3570K. Though the GA-H77N-WIFI is one of the most expensive motherboards on this list, you get what you pay for. This motherboard includes 4 SATA ports, meaning that you can attach up to 4 hard drives or DVD drives to your computer. Plus, 2 of the 4 SATA ports use the SATA 6GB/s standard, which is ideal if you plan on using SSDs in your Hackintosh. The color scheme of the motherboard is pretty slick, too (if that's something you base your buying decisions off). Hackintosh Ability: Like all Gigabyte motherboards, the GA-H77N-WIFI doesn't disappoint for Hackintoshes. Almost every feature works in Mac OS X without a hassle. 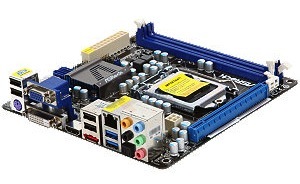 In fact, this motherboard has been directly recommended by tonymacx86 himself, as part of his CustoMac Mini 2012 build. And unlike previous generations of Gigabyte motherboards, you don't even need a DSDT file to everything on the GA-H77N-WIFI working. Sleep mode and speed stepping (CPU power management) work by default. For setup, just run Multibeast 5 once, and forget it. The only feature that doesn't work is the motherboard's built-in WiFi adapter. This is a bummer, since built-in WiFi is one of the biggest differentiating features in Gigabyte's mini-ITX motherboards, but you can always just buy a separate wifi adapter instead. What you get: The Gigabyte GA-Z77N-WIFI is the sibling of the previously mentioned GA-H77N-WIFI. The two motherboards are almost exactly identical; both support Intel's "Ivy Bridge" processors, offer 4 SATA ports, have a slick color scheme, and so on. The main difference is that the GA-Z77N-WIFI allows you to overclock your processor. Since most people don't overclock "mini" computers, the benefit of having overclocking abilities on a mini-ITX motherboard is pretty limited. Nevertheless, it's only $10 extra, so the choice is up to you. 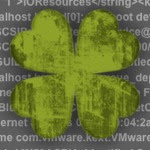 Hackintosh Ability: Again, it's the same old story. The GA-Z77N-WIFI is recommended by tonymacx86 for his CustoMac Mini 2012 build. Everything works with little to no hassle, with the exception of the built-in WiFi. Overall, another great choice for your Hackintosh. What you get: With the release of Gigabyte's new H77 and Z77 mini-ITX motherboards, the GA-H61N-USB3 isn't as popular as it used to be. Nevertheless, it's still a very reliable motherboard for Hackintoshes, that supports Intel's 2nd-generation "Sandy Bridge" processors by default. Sandy Bridge processors have a model number that starts with a "2", such as the i5-2500K. The motherboard itself is extremely basic: it only has 2 SATA ports. Plus, both of these 2 SATA ports are 3Gb/s instead of 6Gb/s, meaning that they're too slow for SSDs. Hackintosh Ability: The GA-H61N-USB3 was one of the original motherboard recommendations made by tonymacx86 on his CustoMac Mini post, so you know that it's good for Hackintoshing. There's a DSDT file available in tonymacx86's DSDT section, of course. Setup is extremely easy; all you have to do for post-installation with this motherboard is run Multibeast 4 one time (check the builds threads below for specific Multibeast setups). After that, everything works without any hassle (with the possible exception of USB 3.0, which has not yet been confirmed). Though both of these build threads only describe installing Mac OS X Lion on the GA-H61N-USB3, the installation process for OS X Mountain Lion is exactly the same. You can even use the Lion version of Multibeast (Multibeast 4) with Mountain Lion. Just make sure that you don't use the GTX 550Ti graphics card that's mentioned in sundanc3's Mini HackPro build; that card has serious compatibility issues with Mountain Lion. What you get: The ASRock H77M-ITX was one of the first mini-ITX motherboards to work with Intel's "Ivy Bridge" processors. Although Gigabyte's new mini-ITX motherboards have since stolen the show, the H77M-ITX costs $20 less than those boards, so it still has a competitive advantage. In terms of hard drive connectivity, the H77M-ITX has two SATA 6Gb/s ports, in addition to two SATA 3Gb/s ports, meaning that it can support up to 4 hard drives, SSDs, or DVD drives. This motherboard also has a pretty cool-looking black color scheme. Hackintosh Ability: Since the H77M-ITX isn't made by Gigabyte, it's not quite as easy to set up for Mac OS X. The hardest part is that you have to install a patched BIOS on the motherboard, in order to enable speed stepping (CPU power management) in OS X. You can find more details in CBorg's "IvyBrick" build thread (link below). On the plus side, this motherboard doesn't require a DSDT file to work with OS X; once you've installed the patched BIOS, just run Multibeast 5. Again, be sure to check CBorg's build thread for a specific Multibeast setup. USB 3.0 works on this motherboard, which is a rarity for Hackintoshes. The only thing that doesn't work with this motherboard is sleep mode. What you get: The ASRock H67M-ITX is actually a surprisingly popular choice in the Hackintoshing community, considering how rarely ASRock motherboards are used in Hackintoshes. 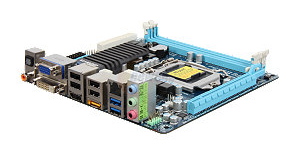 In essence, this motherboard is simply an older version of the H77M-ITX (described above). Because of this, the H67M-ITX only supports Intel's older 2nd-generation "Sandy Bridge" processors by default. Like the H77M-ITX, the H67M-ITX has two SATA 3Gb/s ports, as well as two SATA 6Gb/s ports. Hackintosh Ability: Unfortunately, the setup process for the ASRock H67M-ITX isn't totally straightforward, since there's a lot of conflicting information. First off, you have to install a patched BIOS in order to make the H67M-ITX work with speed stepping in Mac OS X. You can download the BIOS file from here. There are no specific instructions on how to install a new BIOS onto the H67M-ITX, though the process is probably very similar to the method for updating the BIOS on Gigabyte motherboards. After you get that figured out, install OS X Mountain Lion, and create a DSDT file for your motherboard with DSDT Editor. Finally, install the following options in Multibeast 5. Once you get through that rather complicated installation process, everything on the motherboard should work. This includes USB 3.0 and sleep mode (though sleep might not work in every case). 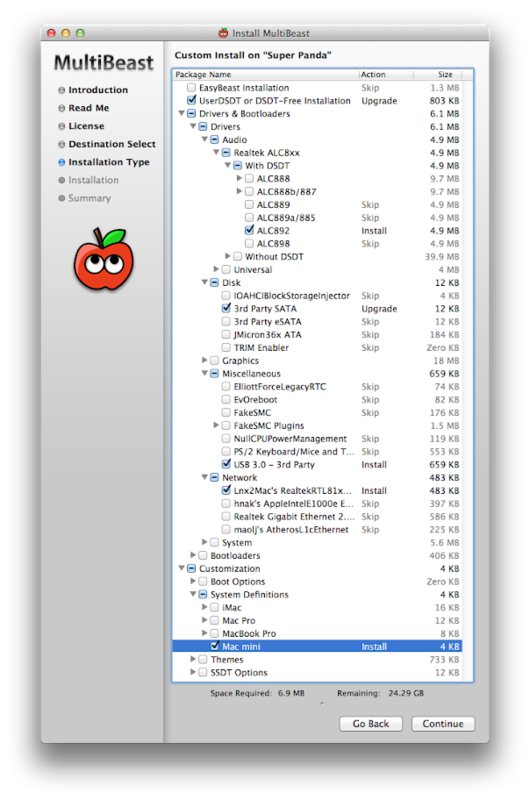 Unfortunately, none of these build threads present a clear setup process for OS X Mountain Lion, which is why I took the liberty of giving specific installation instructions in the "Hackintosh Ability" section above. However, these threads are still useful resources. What you get: For only $65, the Foxconn H67S may be the cheapest Intel-processor motherboard that you'll ever buy. By default, the H67S supports Intel's 2nd-generation "Sandy Bridge" processors. It has three SATA ports: two SATA 6Gb/s ports, and a single SATA 3Gb/s port. The H67S is also the only motherboard on this list that doesn't have any USB 3.0 ports; instead, it carries six USB 2.0 ports. Overall, it's not a bad deal. 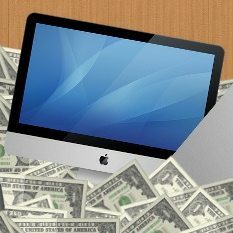 Hackintosh Ability: The main advantage of the Foxconn H67S is that it's very cheap. It's not too hard to setup for Mac OS X, either. Like the ASRock motherboards on this list, you'll have to download and install a patched BIOS on the H67S, for it to work with speed stepping in OS X. Tonymacx86 doesn't have a DSDT file for the H67S in its DSDT section (you'll have to download a DSDT from the HoboMac article linked below). Otherwise, as usual, you can enable just about everything with a single run of Multibeast. Check the HoboMac article linked below for details on the patched BIOS, DSDT file, and Multibeast setup. Generally, the H67S runs Mac OS X well, considering that Foxconn motherboards are rarely used for Hackintoshes. The most important problem is that sleep mode doesn't always work. The H67S is the motherboard used by MacBreaker's own super-low-budget HoboMac build. However, if you're looking for a truly compact build, you'll probably have to substitute the Antec 200 case used by HoboMac for something smaller.